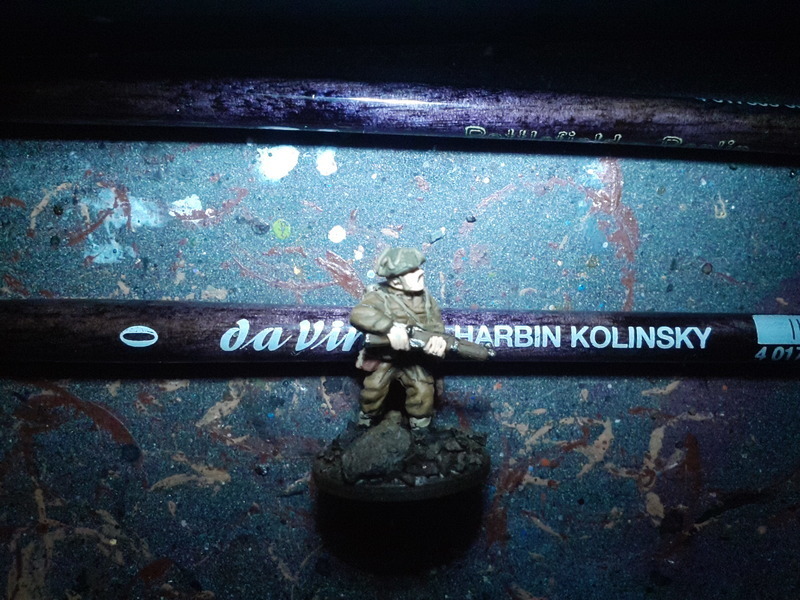 and finally decided for 73.201 Black Wash, thinned a bit with water over basically the whole model except the uniform. 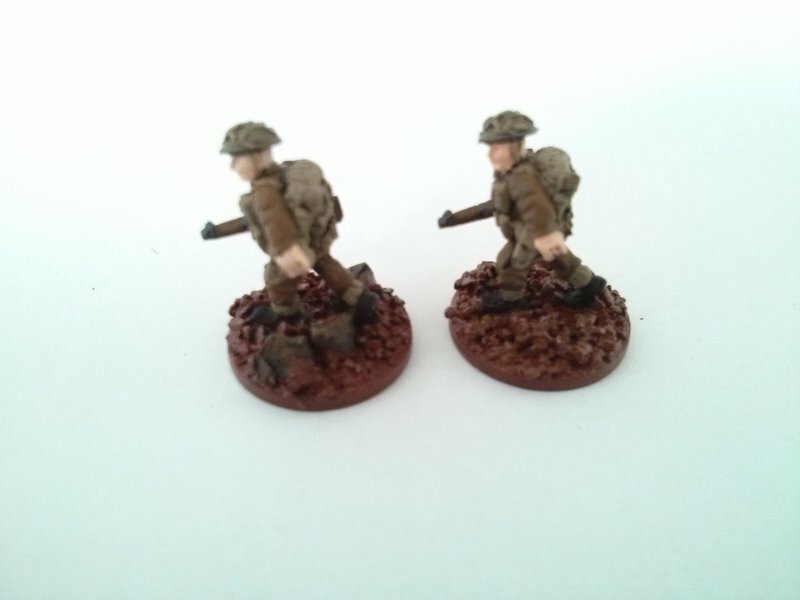 Using a brownish wash with the skin was making it too similar to the uniform, the black wash gave more contrast. Also the Khaki had a better contrast to the uniform with black in my mind. 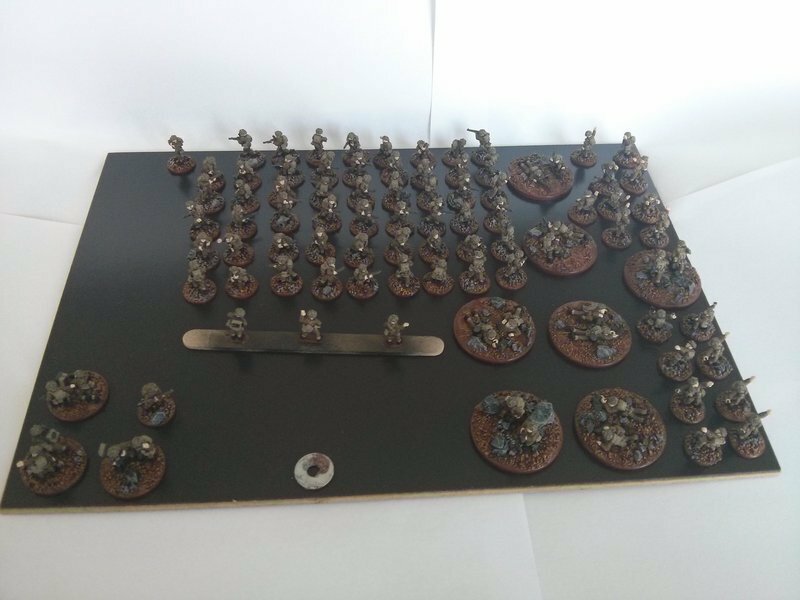 The wood of rifles and the spades were highlighted with 70.983 Flat Earth, the olive equippment with 70.888 Olive Grey. 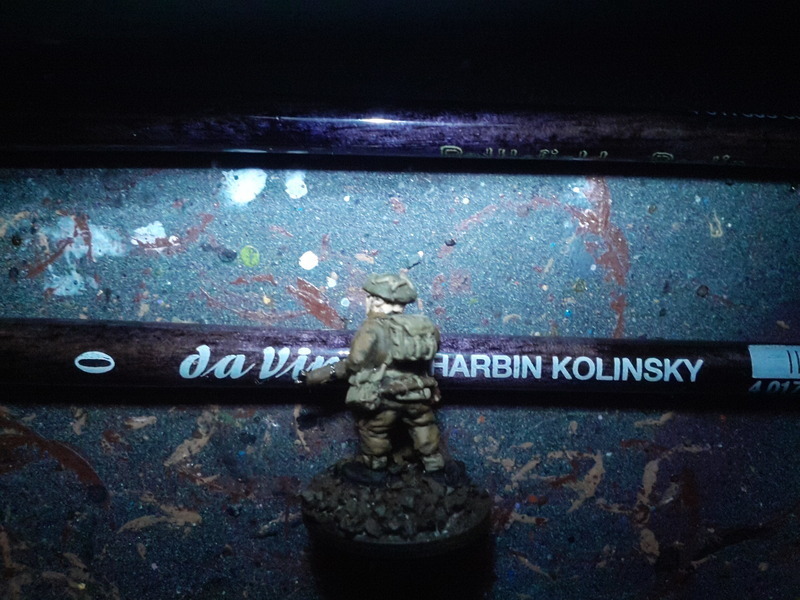 Finally, the backpacks where lightened up again with a quick drybrush of 70.988 Khaki and 70.951 White. 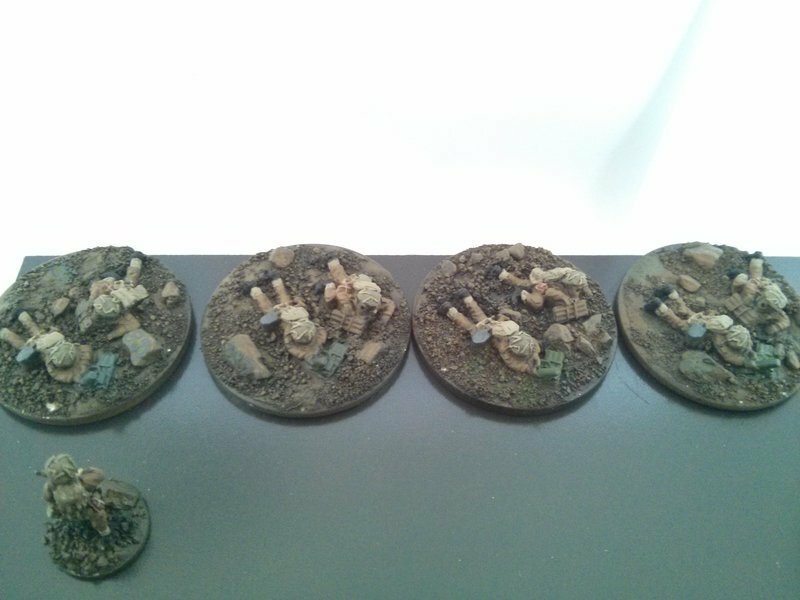 The stones are all painted and drybrushed. 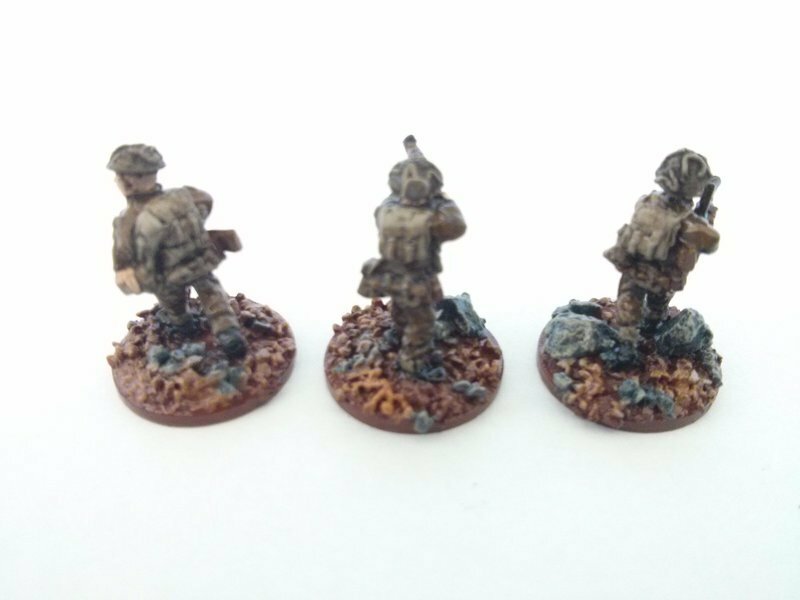 After this step, I went over the models again with Black and British Uniform to cover all the errors I did so far (mainly on the boots and lower legs due to the drybrushing of the bases), and repainted the helmets in Russian Uniform where the colour started to peel off. 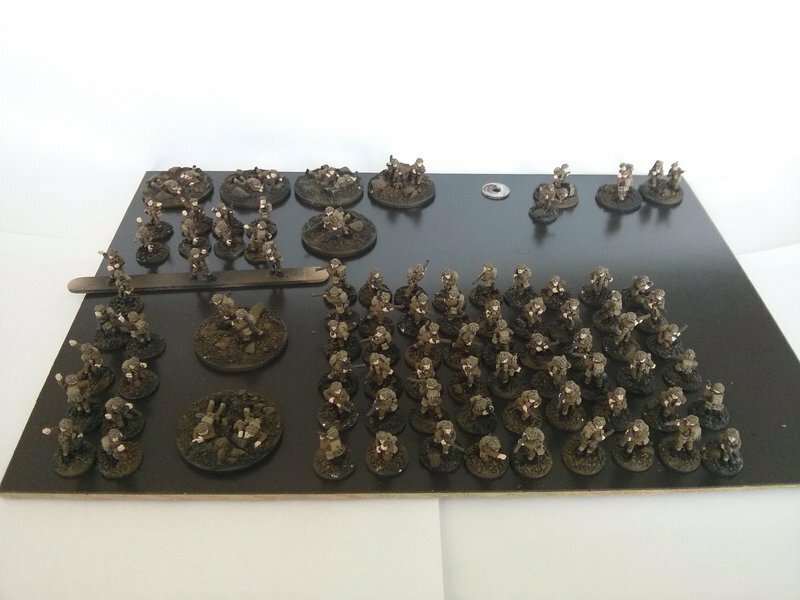 As the peeling started, I now gave the models a coat of gloss varnish, to seal the current state. 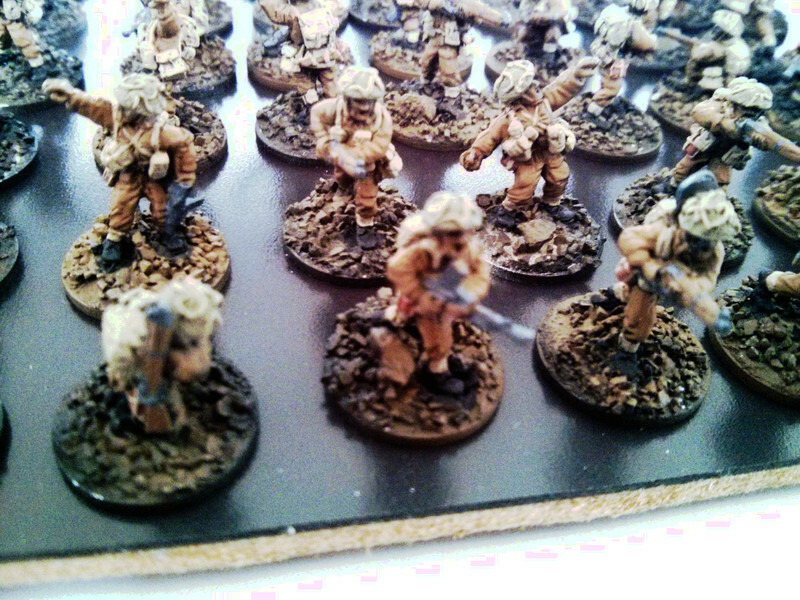 Especially the helmets, where I picked the models up mainly for doing all the bases, should be safe from chipping now. 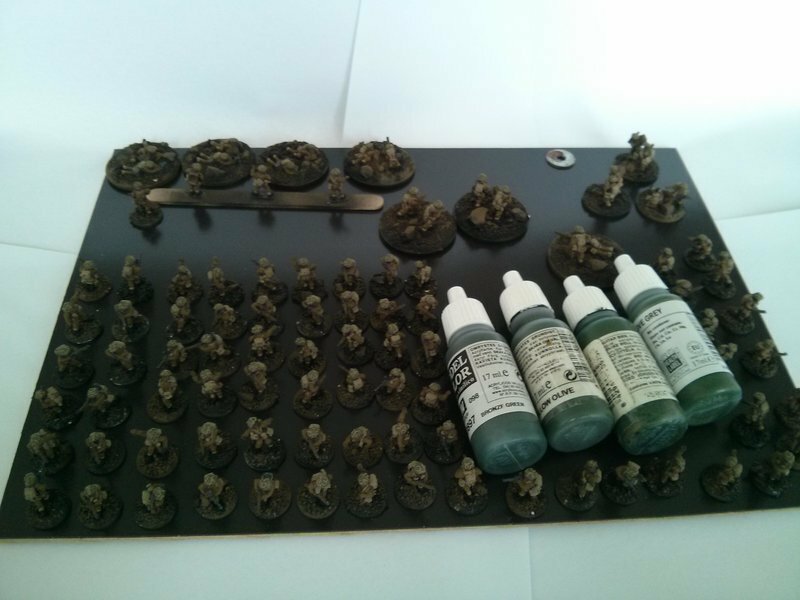 Also, the gloss varnish will help the washes which are to follow to flow more easily. does not really change the colour (only slightly), but dampens the brightness of the basecoat. where you can also see the first individual stones painted. 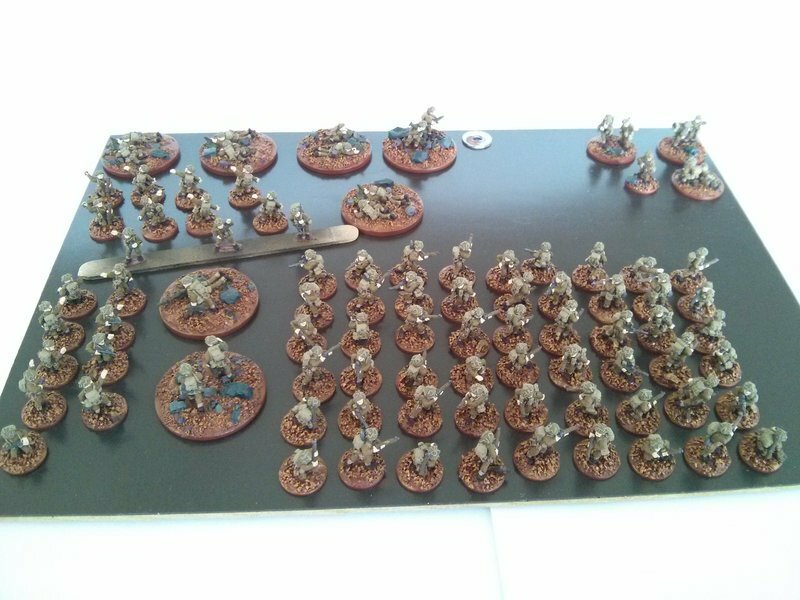 I painted all the bases in the usual brown of my base style, paying extra attention to not get paint on the boots or the uniform of kneeling/prone models. 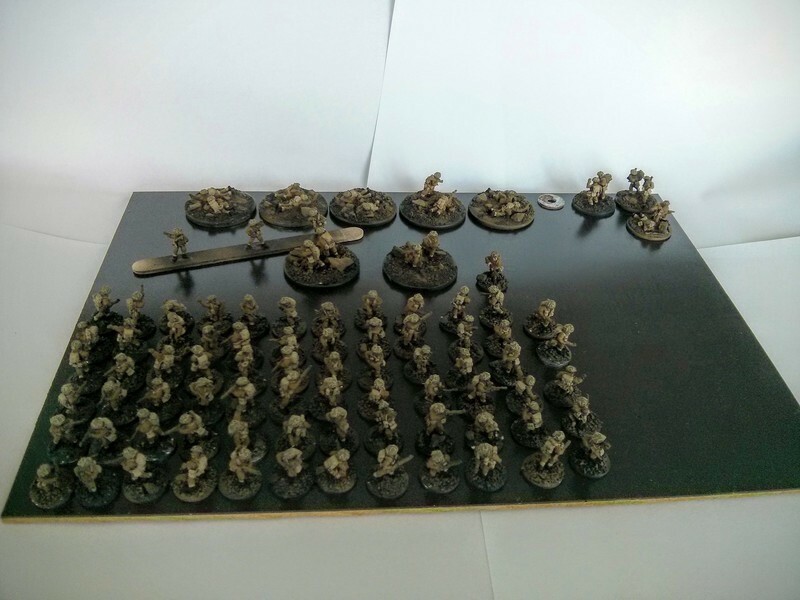 I settled for 70.892 Yellow Olive for the support weapons, grenades, binoculars, etc. 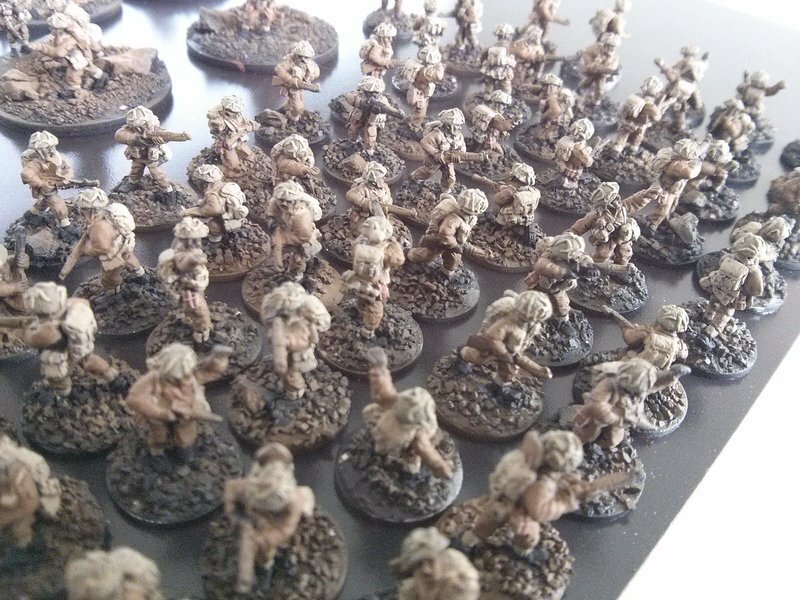 The skin was painted 70.815 Basic Skintone. The support weapons (PIATs and mortars) as well as all the equipment like grenades, binoculars, radios etc. will be painted green. 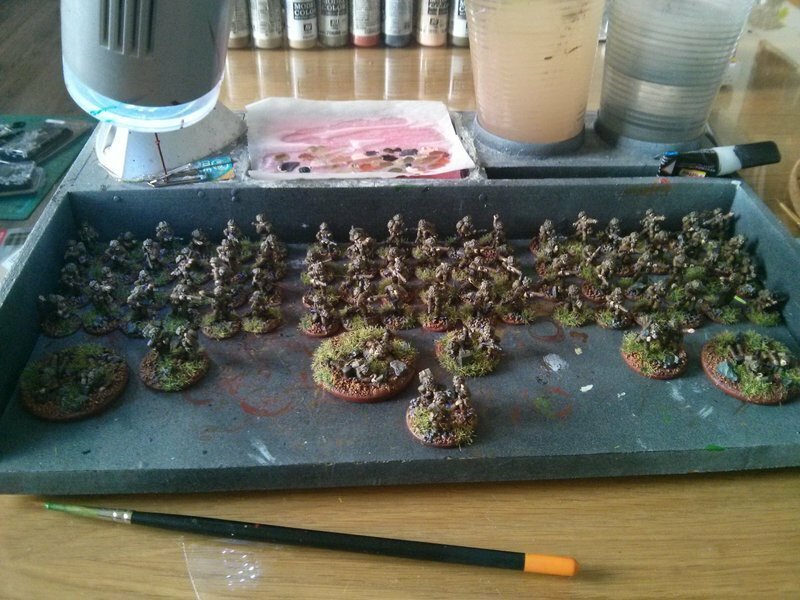 Searching for the right shade of green I camo across a multitude of descriptions, the colour also seems to has changed during the War. 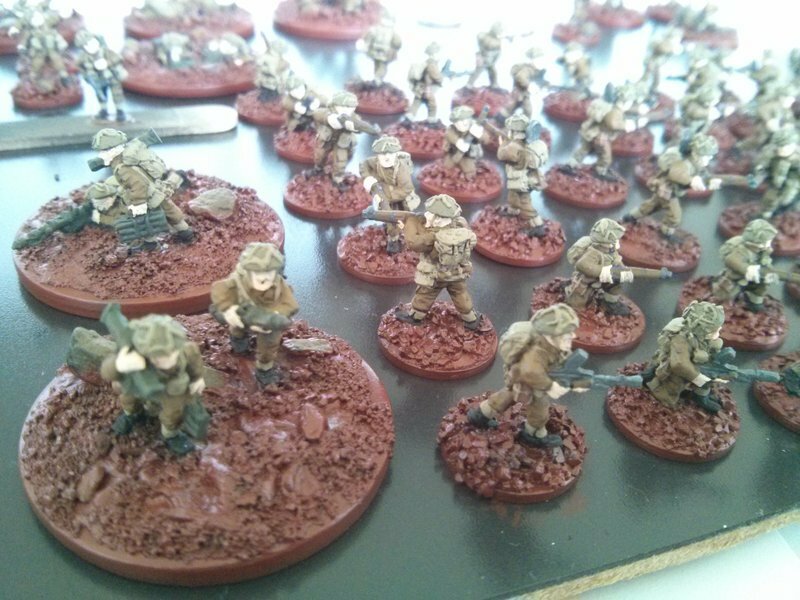 Adding to that the usual wear and tear, bleaching from the sun, field repairs with non-regulation paint etc., I figured any deepish-olivish-greenish shade will do. 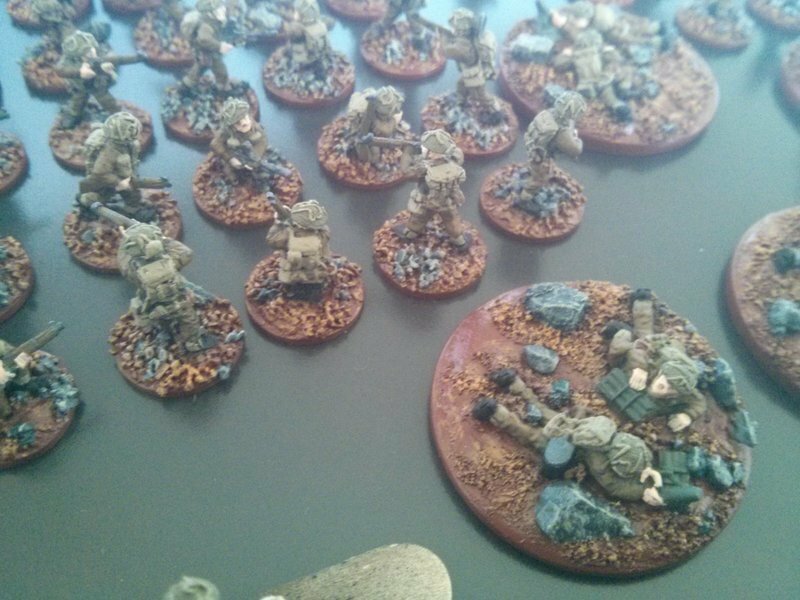 I painted 4 testmodels, probably I will take on of the two shades of green on the right. All the webbing, anklets and helmet cover is done. Next up are the wood and metal parts. 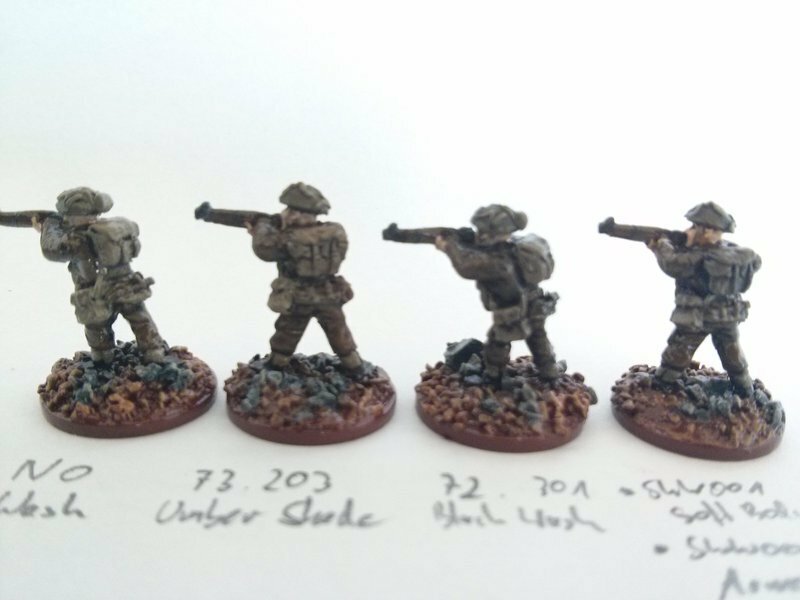 Some progress on the Brits. 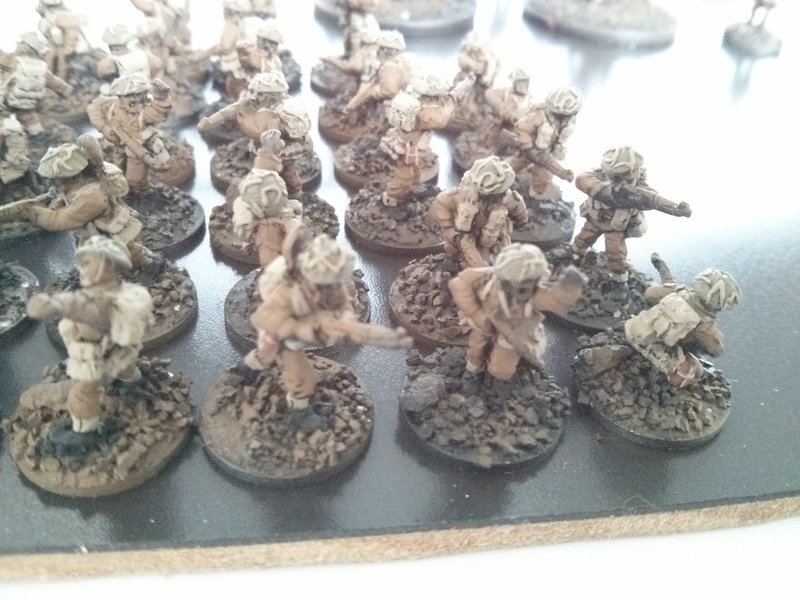 I painted all helmets in 70.924 Russian Uniform, the field flasks in 70.846 Mahagony Sand and am now in the process of painting 70.988 Khaki on the anklets, all the webbing, the backpacks, the camouflage strips on the helmets... this takes forever, but after this step the most difficult and time consuming parts will be done. 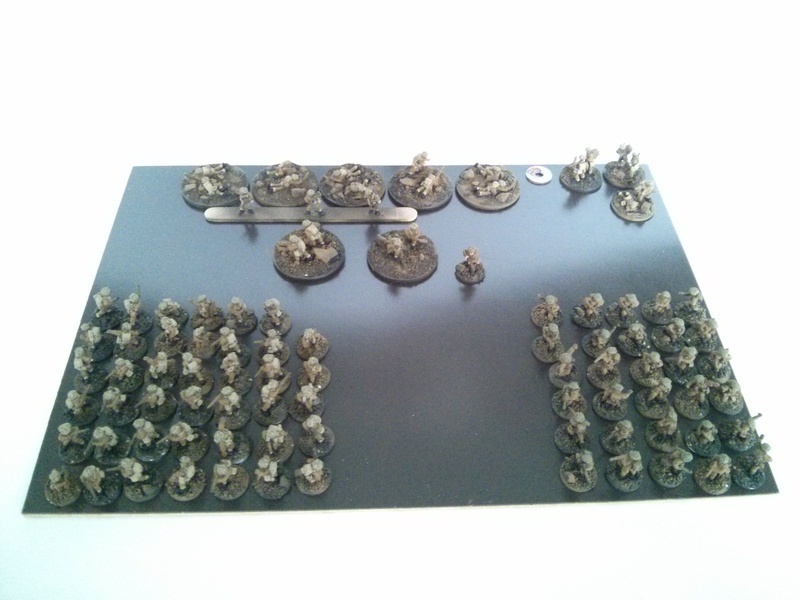 In the picture below, the models in the right lower corner are still to be done in Khaki. 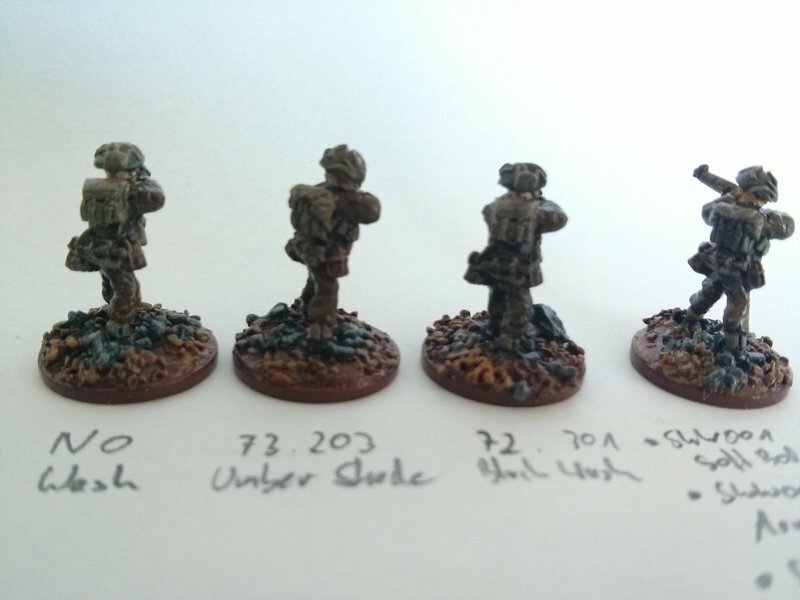 With the Wehrmacht done, I started to work on the British troops. 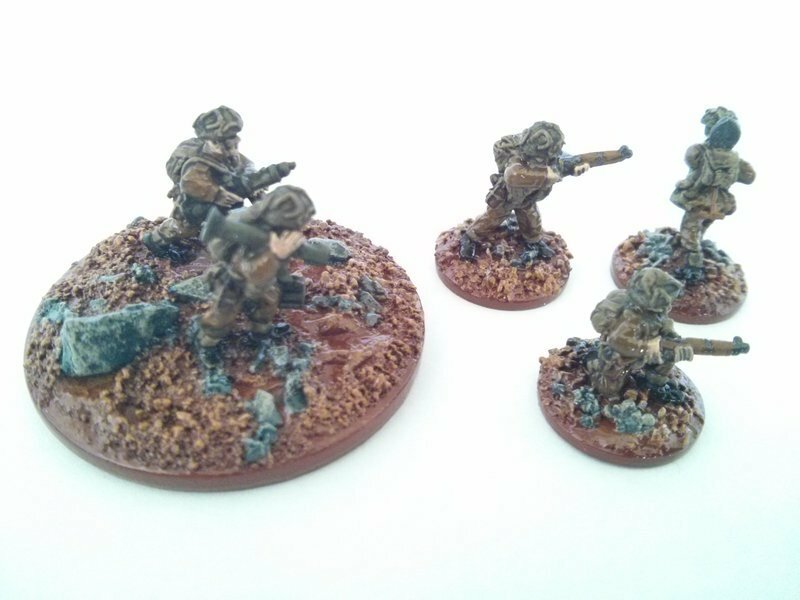 First, I painted the boots on all miniatures black. Next, I highlighted the uniforms with 'British Uniform'. 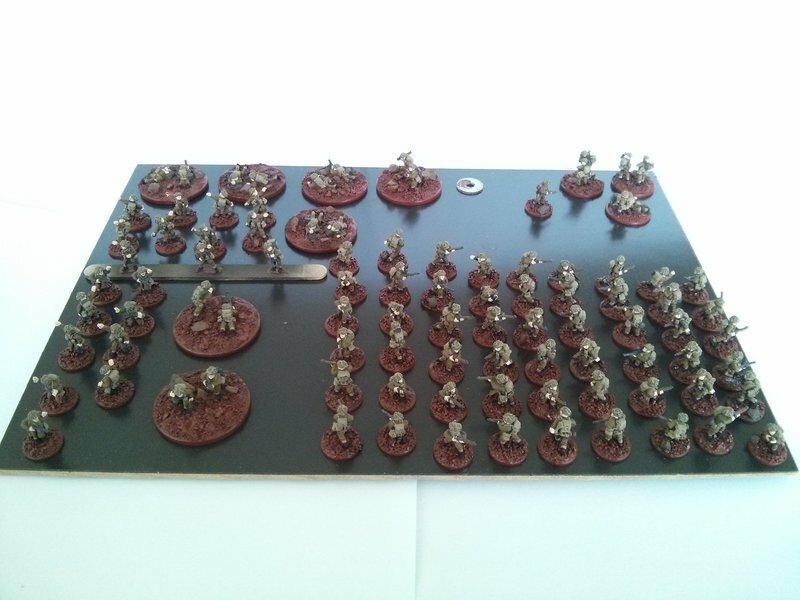 This is the same colour I airbrushed over the black basecoat, but brushed on it is much more intensive. 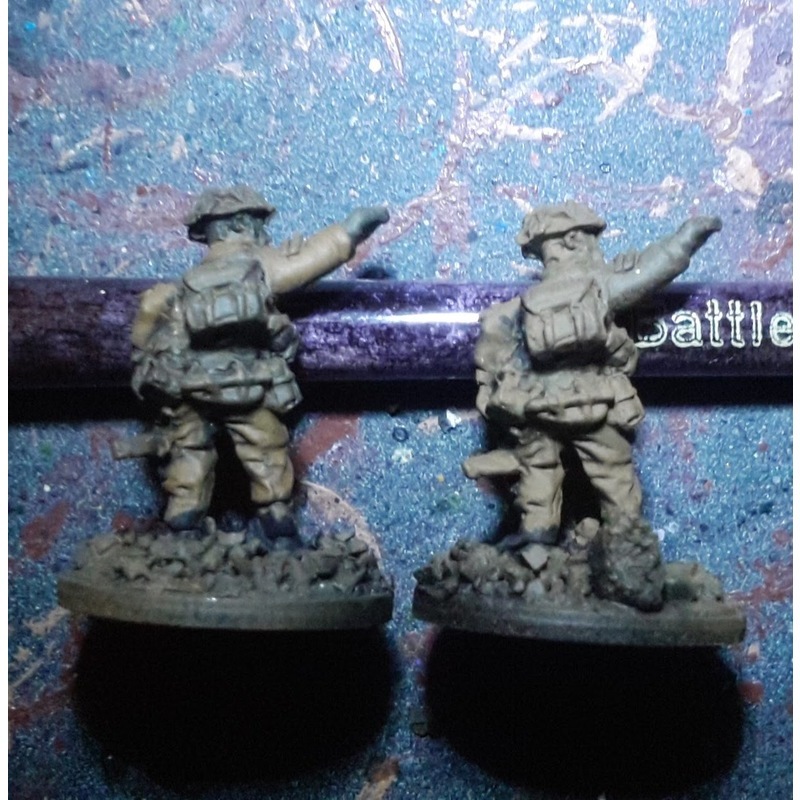 On the below picture, the left model is the highlighted one, the right a model with only the brown airbrushed on. 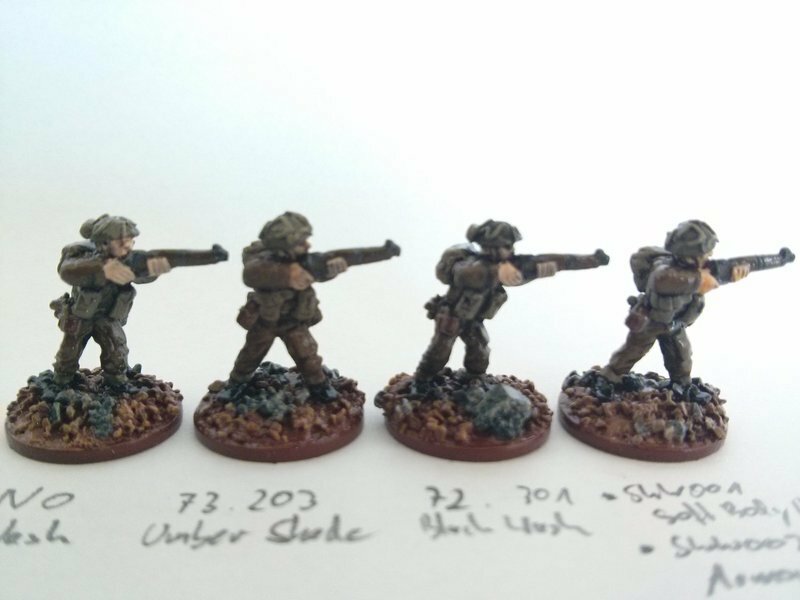 The following is my test model, with all the different colours painted, but no highlights yet except for the uniform as described above. I am happy with the colour selection, and will proceed like this with all the models.